A prolific printmaker, known for his ingenious linocuts, Eric Thake considered his rarer oils and watercolours of greater significance. Thake studied at the National Gallery of Victoria Art School and later with George Bell, whose interest in formal design and abstraction through pictorial organisation, as well as the theory of dynamic symmetry, influenced the young artist. 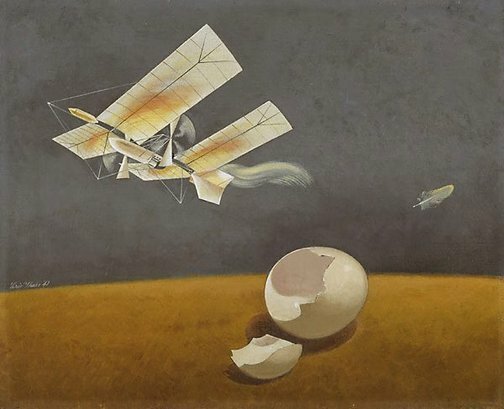 By the late 1930s, Thake’s work revealed an awareness of the metaphysical experiments of Giorgio de Chirico and the English surrealists, Edward Wadsworth and Paul Nash. 'Archaeopteryx' is a superb example of Thake’s meticulous and witty paintings, its directness derived from his experience as a graphic artist and medical illustrator. 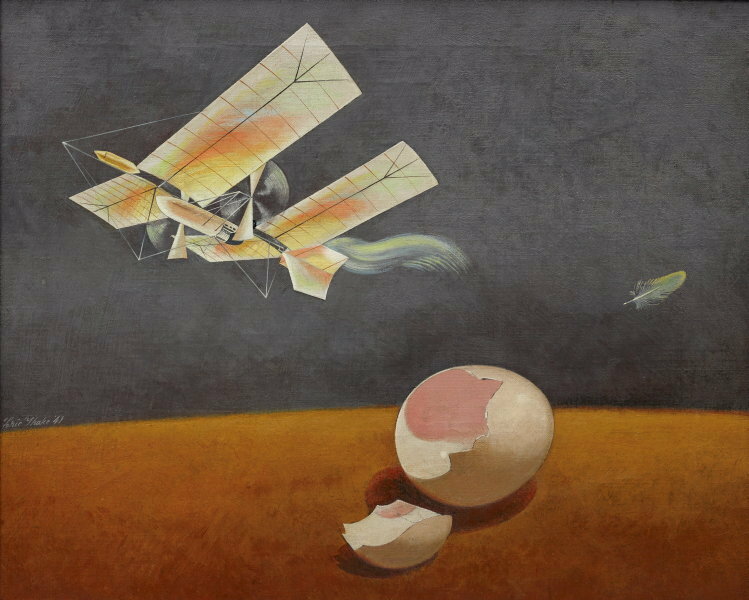 The inspiration for 'Archaeopteryx' was a book by Willy Ley in which Australia is described as a world’s-end warehouse of nature’s experiments: the lizard-like head and feathered body of the flying machine evokes the prehistoric creature of the title. Signed and dated c.l., white oil "Eric Thake '41". Australian artists'., Art in Australia [series 4, no. 4] , 'Paintings recently exhibited, Sydney, Dec 1941-Feb 1942, 63 (illus.). Christopher Chapman, Surrealism in Australia , Canberra, 1993, 51 (colour illus.). Mary Eagle and Jan Minchin, The George Bell School: Students - Friends - Influences , Melbourne, 1981, 28-29. Patrick White, painter, manqué: paintings, painters and their influence on his writing , 'Patrick White's choice', pg. 114-119, Carlton, 2002, 115. Bruce James, Art Gallery of New South Wales handbook , 'Australian Collection: Painting and Sculpture', pg. 102-181, Sydney, 1999, 148 (colour illus.). Elizabeth Lawson, Birds , Canberra, 1999, 11. Surrealism: Revolution by night , Canberra, 1993, 265 (colour illus.). Barry Pearce, Art Gallery of New South Wales handbook , 'Australian', pg. 13-35, Sydney, 1988, 26. Natalie Wilson, Australian art: in the Art Gallery of New South Wales , 'Out of Melbourne: realisms and mythologies', pg. 163-164, Sydney, 2000, 164, 165 (colour illus. ), 302.